Some of the more pessimistic commentators at the time of the credit crunch, myself included, said that the aftermath of the crash would dominate our economic and political lives for at least ten years. What I wasn’t expecting – what I don’t think anyone was expecting – was that ten years would go by quite so fast. At the start of 2008, Gordon Brown was prime minister of the United Kingdom, George W. Bush was president of the United States, and only politics wonks had ever heard of the junior senator from Illinois; Nicolas Sarkozy was president of France, Hu Jintao was general secretary of the Chinese Communist Party, Ken Livingstone was mayor of London, MySpace was the biggest social network, and the central bank interest rate in the UK was 5.5 per cent. As we do our best to learn from our mistakes, we might wish a spectacularly happy birthday to Phineas Taylor (“P.T.”) Barnum; he was born on this date in 1810. Nobody ever lost a dollar by underestimating the taste of the American public. In what business is there not humbug? 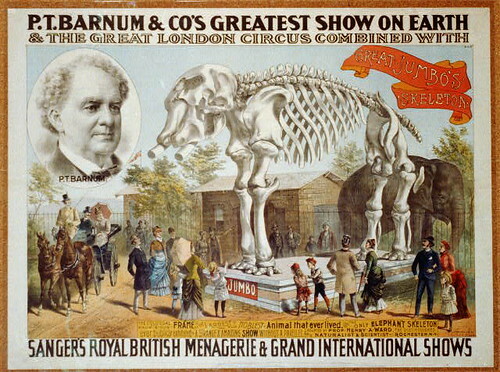 Barnum came by his wisdom the round-about way: he founded and ran a small business, then a weekly newspaper in his native Connecticut before leaving for New York City and the entertainment business. He parlayed a variety troop and a “curiosities” museum (featuring the ‘”Feejee” mermaid’ and “General Tom Thumb”) into a fortune… which he lost in a series of legal setbacks. He replenished his stores by touring as a temperance speaker, then served as a Connecticut State legislator and as Mayor of Bridgeport (a role in which he introduced gas lighting and founded the Bridgeport hospital)… It wasn’t until after his 60th birthday that he turned to endeavor for which he’s best remembered– the circus.